PLOT: An outlaw smuggler and her alien companion are recruited by the Emperor of the Galaxy to rescue his son and destroy a secret weapon. The first rule of Film Club is that you must talk about Film Club. The second rule of Film Club is that you much watch the film (well durrrr!). With the launch of our brand new video podcast, we have introduced a new audience participation feature, the MovieMuse Film Club. In traditional Richard & Judy style, we unilaterally pick a film, force the crew and hopefully the public to watch it and then talk about it in the next show. 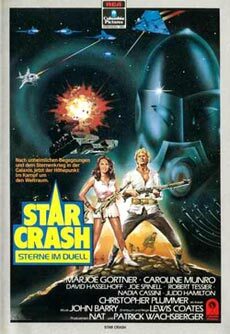 We let the most critical of our critics take first shot at picking a film for us all to endure and Mat ‘Witchfinder’ Corne chose the 1978 oddity Star Crash. You can see what we thought of the film below, or to listen to us bicker about its merits (or lack of them) check out episode 2 of MovieMuse TV. Gordon: "comparisons to Star Wars are obvious, but misplaced"
Graeme: "this film was brilliant... it had a bit of heart and soul"
Simon: "what's the christmas tree doing in the background?" Pete: "nearly as bad as Hawk the Slayer"
More fun than we were expecting, but is never going to challenge likes of Star Wars in terms of action, special effects or adventure. A surprisingly good soundtrack and some great costumes help it to a respectable score.